We’d love your help. 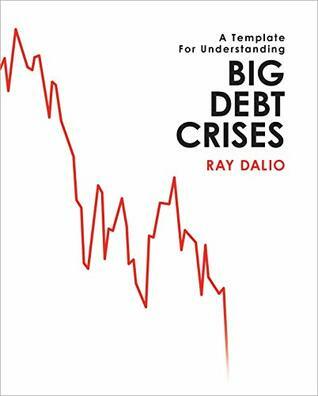 Let us know what’s wrong with this preview of Big Debt Crises by Ray Dalio. For the 10th anniversary of the 2008 financial crisis, one of the world’s most successful investors, Ray Dalio, shares his unique template for how debt crises work and principles for dealing with them well. This template allowed his firm, Bridgewater Associates, to anticipate events and navigate them well while others struggled badly. The template comes in three parts provided in three books: 1) The Archetypal Big Debt Cycle (which explains the template), 2) 3 Detailed Cases (which examines in depth the 2008 financial crisis, the 1930’s Great Depression, and the 1920’s inflationary depression of Germany’s Weimar Republic), and 3) Compendium of 48 Cases (which is a compendium of charts and brief descriptions of the worst debt crises of the last 100 years). Whether you’re an investor, a policy maker, or are simply interested, the unconventional perspective of one of the few people who navigated the crises successfully, Principles for Navigating Big Debt Crises will help you understand the economy and markets in revealing new ways. To ask other readers questions about Big Debt Crises, please sign up. Curious if anyone can confirm the units of time in some of the charts early on in the book. For example, on page 17 of the PDF the X axis of the chart ranges from -60 to 84. I assume these are months, and Dalio has set the chart such that the "top" of his archetypal Deflationary Debt Cycle occurs at time t=0. Thoughts? I received this book, for free, in exchange for an honest review. This book is an excellent book for a specific audience. This book needs to be read slowly and deliberately. It is a work of great intelligence and research with a corresponding level of reading difficulty. Much of the information was above my head and could only be understood if I were to devote months to read this. As a background, I have an intermediate level of finance/investing knowledge which is far better than average. That bein I received this book, for free, in exchange for an honest review. •	To anticipate a debt crisis well, one has to look at the specific debt-service abilities of the individual entities, which are lost in these averages. More specifically, a high level of debt or debt service to income is less problematic if the average is well distributed across the economy than if it is concentrated—especially if it is concentrated in key entities. While some people think that the amount of money in existence remains the same and simply moves from riskier assets to less risky ones, that’s not true. Most of what people think is money is really credit, and credit does appear out of thin air during good times and then disappear at bad times. For example, when you buy something in a store on a credit card, you essentially do so by saying, “I promise to pay.” Together you and the store owner create a credit asset and a credit liability. So where do you take the money from? Nowhere. You created credit. •	Governments often end up prioritizing the payment of loans from multinational institutions like the IMF and BIS, as it’s important to maintain availability of support from these public entities, who effectively act as lenders of last resort to countries under stress. •	If they provide QE and private credit growth doesn’t pick up, policy makers feel like they are pushing on a string. •	While it is widely known that central banks manage the trade-offs between inflation and growth by changing interest rates and liquidity in the system, what is not widely known is that the central bank’s trade-offs between inflation and growth are easier to manage when money is flowing into a country’s currency/debt and more difficult to manage when it’s flowing out. That’s because if there is more demand for the currency/debt, that will push the currency/debt prices up, which, all else being equal, will push inflation down and growth up (assuming the central bank keeps the amount of money and credit steady); when there is less demand, the reverse will happen. •	If investors are burned with negative returns for too long and the currency keeps falling, that’s frequently the break-point that determines if you’re going to have an inflationary spiral or not. The central bank’s objective should be to allow the currency to get cheap enough that it can provide the needed stimulation for the economy and the balance of payments, while running a tight enough policy to make the returns of owning the currency attractive. As you can see in the chart below, returns to holding the currency for foreigners start out negative, but then rally about a year after the devaluation. •	Tops are typically made when the rate of buying is unsustainable (which is also when people think prices will rise) and bottoms are made when the rate of selling is at a pace that’s unsustainable (typically when most people are bearish). "Remember that money serves two purposes: it is a medium of exchange and a store hold of wealth. And because it has two purposes, it serves two masters: 1) those who want to obtain it for “life’s necessities,” usually by working for it, and 2) those who have stored wealth tied to its value. Throughout history these two groups have been called different things—e.g., the first group has been called workers, the proletariat, and “the have-nots,” and the second group has been called capitalists, investors, and “the haves.”"
"Inflationary depressions classically occur in countries that are reliant on foreign capital flows and so have built up a significant amount of debt denominated in foreign currency that can’t be monetized (i.e., bought by money printed by the central bank)." "In fact, the reward-to-risk ratio could make those who are long a lot of assets view that terribly returning asset called cash as more appealing. As a result, QE becomes less and less effective. If they provide QE and private credit growth doesn’t pick up, policy makers feel like they are pushing on a string." "Printing money and doing direct cash transfers to households (i.e., “helicopter money”). When we refer to “helicopter money,” we mean directing money into the hands of spenders (e.g., US veterans’ bonuses during the Great Depression, Imperial China)." "gradual and persistent currency decline causes the market to expect continued future currency depreciation, which can encourage increased capital withdrawal and speculation, widening the balance of payments gap. A continual devaluation also makes inflation more persistent, feeding an inflation psychology. That’s why it’s generally better to have a large, one-off devaluation that gets the currency to a level where there’s a two-way market for it (i.e., where there isn’t broad expectation that the currency will continue to weaken"
"managing debt crises is all about spreading out the pain of the bad debts, and this can almost always be done well if one’s debts are in one’s own currency. The biggest risks are typically not from the debts themselves, but from the failure of policy makers to do the right things due to a lack of knowledge and/or lack of authority. If a nation’s debts are in a foreign currency, much more difficult choices have to be made to handle the situation well—and, in any case, the consequences will be more painful." "policy makers suspended the conversion of money to gold on July 31, September 22, 1915 The government also authorized the Reichsbank to buy short-term Berliners Buy War Bonds; Rush for Subscriptions to Third German Loan Treasury bills and use them, along with commercial bills, as collateral"
Another great book from Ray Dalio. He presents a sound framework for understanding inflationary and deflationary debt cycles, and then analysis in details the German Debt Crisis of 1918-1924 as well as the US Debt Crisis of 1928-1937 and 2007-2011. There's also a chapter of 48 case studies with computer generated text. The book is very interesting but rather long and I wish the author would also explore and present the debt crisis from the perspective of the Austrian School of Economics. Mr. Dalio, or rather his research team, have done a remarkably good job synthesizing a large data set of financial booms and busts. I feel he falls into causal reductionism in attempting to describe systemic responses to financial crises. Admittedly, for those many states that suffer from chronic broken record syndrome, like Argentina, this analysis is useful. If we reduce our focus to the US, my only investment concern, his analysis is of little relevance. There's abundant prima facie reasons to Mr. Dalio, or rather his research team, have done a remarkably good job synthesizing a large data set of financial booms and busts. There's abundant prima facie reasons to believe our government has extended financial promises that cannot reasonably be met. Of course, the corporate and individual realms also contain many IOUs that will never be realized in full. Given the uncertainties inherently associated in forecasting in an economy with America's size and breadth, and the rarity of modern financial panics in developed economies (some 75 years passed between that last two major American financial panics), Mr. Dalio's research offers little insight into America's financial future, other than to remind us of the potential for failing to deliver as promised; the how, why, what, where and when of it all still remain great unknowns, however. В целом несложный фреймворк для исследования финансовых кризисов. Есть и отчеты по российским. Probably the best book I've read on economics. Very easy to follow and thoroughly documented. I'd recommend it to anyone interested in finance or economics. Looks like a very interesting book on financial crises from a source that might not be the first that the layman would want to turn to but which speaks with an authority based on actual practical experience rather than from political ideology. A complementary review in the FT is here while a link to get the book for free is here. Here is a quote from the FT review which in turn quotes the book. So a decade of austerity in the UK has been counterproductive has it? Well color me surprised, but inter Looks like a very interesting book on financial crises from a source that might not be the first that the layman would want to turn to but which speaks with an authority based on actual practical experience rather than from political ideology. "...'Austerity causes more pain than benefit, big restructurings wipe out too much wealth too fast, and transfers of wealth from haves to have-nots don’t happen in sufficient size without revolutions.' He adds that money printing is not necessarily inflationary, as proved the case in the last decade..."
If you have money in the stock market or real estate, the debt cycle is an important thing to understand. These books are an incredibly detailed overview of how the debt cycle works, how countries can manage the cycle, and in-depth case studies on three major debt crises from history. If you're like me and don't have a formal background in finance or economics the books may feel a bit dense. I recommend going slow in this case and spending time absorbing the concepts. Doing this really helped me If you have money in the stock market or real estate, the debt cycle is an important thing to understand. These books are an incredibly detailed overview of how the debt cycle works, how countries can manage the cycle, and in-depth case studies on three major debt crises from history. If you're like me and don't have a formal background in finance or economics the books may feel a bit dense. I recommend going slow in this case and spending time absorbing the concepts. Doing this really helped me get a better understanding of where the United States currently is with quantitative tightening and high corporate debt, how various scenarios could potentially unfold, and signals to watch for. This is simply one of the best book I have read on macroeconomic. It provides a framework, through very detailed historical case studies, for understanding why the engine of the financial market sometimes breaks down, what are the economic signals during each stage of the cycle, and the consequences of the right and wrong policy responses. I am a big follower of Warren Buffett, who repeatedly mentioned that any attempt on top down economic forecast is fruitless. Yes it is true. But i do believe This is simply one of the best book I have read on macroeconomic. It provides a framework, through very detailed historical case studies, for understanding why the engine of the financial market sometimes breaks down, what are the economic signals during each stage of the cycle, and the consequences of the right and wrong policy responses. Not my favourite book. I liked much More Mastering the Market Cycle: Getting the Odds on Your Side. I think that it's a good attempt by Ray Dalio to explain his thoughts, but I would have rather prefer he gave a complete view rather than say "I give you something but how I do this is private". I was a bit annoyed by this. If you write a book on this topic give your complete view otherwise it has no point. The first part of the book describes the archetypes of inflationary and deflationary debt crises in great detail. I suppose that for an economist it can be even too simplistic but for the layman is packed with insight and very illuminating. The second part is a series of case analyses crisis by crisis taking into account extensive details, news of the time, etc. You don't need to work that part to get the takeaways of the book. All in all, read it if you have a minimal interest on the next big cri The first part of the book describes the archetypes of inflationary and deflationary debt crises in great detail. I suppose that for an economist it can be even too simplistic but for the layman is packed with insight and very illuminating. I read the PDF version (it's a free download thanks to Ray, the author of the book) - the debt crisis framework is straightforward to understand, but, to make it work, you need to notice the subtle difference described in the case studies. The timing of this book is perfect, the sooner you read it, the better you'd think about how to protect yourself from the upcoming crisis. I hope you enjoy reading it and learn something. A primer on the cyclical capitalista crisis. I learned a ton about medium and long term economy trends thanks to debt. The relationships between the different components of an economy, the key role of debt. The whole book is grind towards the end, but you can read it in order to gain an intuitive understanding of crisis so now reading macroeconomic indicators is easier and provides me some insight were before i was clueless. Recommended read if you want to invest. It is no surprise that Mr. Dalio is such an incredibly successful man. His analysis is so extensive, yet his mastery of the subject matter allows him to explain it succinctly. This is by far the best book I have ever read in terms of analyzing severe market downturns. Amazing read. An in-depth study on the structure of debt that is quite interesting though dry. But whoever thought the study of finance & debt was supposed to be entertaining & comedic! This text is by far the best in the study of debt. I’m sure to refer back to it when needed? Unbelievable book that details both inflationary and deflationary pressures. As a business and finance major, and someone who practices in money management in my career...incredibly detailed read that helped build on my process in better understanding the economic cycle, debt crisis, investor psychology, general economics. Book provides good insight into the topic of crises on the financial market and is a valuable resource for the investors, economists and everyone looking for a way to enhance his finance education. Keep in mind this is highly technical book, not so easy to read and is not suitable for people without enhanced knowledge in finance and economic. To start off, this is a book for people in finance, not easy for the layman. An extension of his youtube videos, this doesnt teach much of anything new, but i loved the newspaper clippings at the end of each of the later chapters; it allows me to relive how things were at the time. Great framework for understanding short term vs. long term debt cycles. Admittedly this is a dense read, especially the specific case studies at the end. However, this is helpful for understanding what are the underlying relationships between social unrest and the credit markets. This is a terrific and must-read piece. there are some good pointers, but this is definitely not an easy read. A must read for anyone who is interested in economics and financial markets! Raymond Dalio (born August 8, 1949) is an American investor, hedge fund manager, and philanthropist. Dalio is the founder of investment firm Bridgewater Associates, one of the world's largest hedge funds.